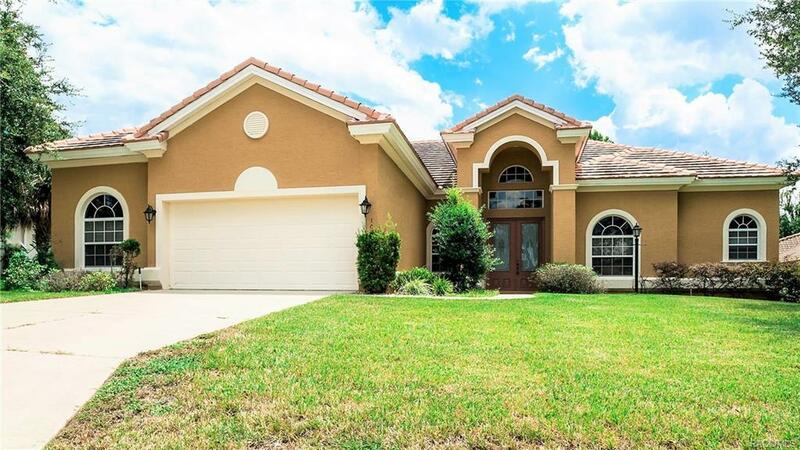 FLORIDA MAINTENANCE FREE LIFESTYLE LIVING! TERRA VISTA GATED GOLF COURSE COMMUNITY! This 3 Bedroom, 2 Office (or 1 Office and 1 Bonus Room), 3 Full Bathrooms, 2 Car Garage Home is Awaiting New Homeowners to Enjoy their New Lifestyle. This Home has Soaring Ceilings, Stone Counters, Formal Dining Room, Living Room, Family Room, Large Master Bathroom with Stone Counters, SS Appliances and 2 Screen Porches. This home has a Large Outdoor Patio that allows Room for a Pool. The Shrubs are a great privacy barrier. The Golf Courses, Tennis Courts, Restaurants, Boccie Ball Courts, Community Pools (indoor pool as well), and Gym/Spa are all available. Call for Appointment! Directions: From Hwy 486. To Terra Vista Entrance, To First R On Circle, To R On N Eagle Chase, To L On Rollingwood, To Home On R.